In the 1880s, Tyler was a blossoming settlement at the edge of the East Texas Piney Woods. Its vast forests would provide lumber for early Texas homes and businesses. And its rich soil would foster both farming and ranching enterprises. In 1887 The McBride agency joined Tyler’s growing roster of businesses marking the beginning of what is now Bergfeld Agency LLC. McBride ran Will McBride & Co. single-handedly until 1932, when he took on two partners – J.A. Bergfeld and his son, J.L. Bergfeld. In 1969, J.L. Bergfeld’s son, Julius, joined the Agency and then became sole owner in 1977. Over 30 years later in 2008 Julius’s son, Brad, joined the agency and in 2015 purchased his father’s interest in the agency. 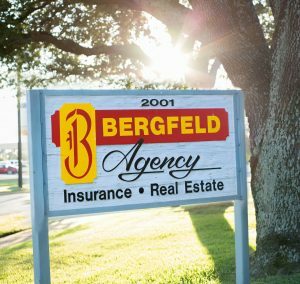 Many things have changed throughout the years but Bergfeld Agency has stood the test of time because of dedicated employees and loyal customers. The agency was founded on the principles of integrity, honesty, and professionalism and those core principles still make up the backbone of Bergfeld Agency today. Bergfeld Agency is not a “volume agent”, quality service and value have been the main focus which has allowed the agency to stay relatively small while still offering great insurance products and strong customer relationships. We strive to provide the best insurance solutions available to our clients. We will continue our long heritage of high ethical standards, unsurpassed customer service, and dedication to our clients, our staff, our community, and our industry.